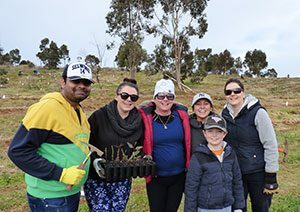 On Sunday 16th July 2017, close to 200 volunteers gathered at Telford Park in Darley, Bacchus Marsh to plant 6000 trees and revitalise the former landfill site. In addition to the 6000 trees planted on the day, another 1000 were planted by school students on Thursday 20th July, meaning the planting goal of 7000 was reached. Moorabool Shire Council partnered with Grow West for 2017 planting day, hosting the event at their reserve, Telford Park. A huge thank you to the many organisations, local groups and volunteers that helped make the day a success including Victorian National Park Association, Friends of Werribee Gorge and Long Forest Mallee, Bacchus Marsh Lions Club, Victorian Mobile Landcare Group, Conservation Volunteers Australia, Dera Sacha Sauda, the Bacchus Marsh Scouts and Girl Guides and the great Bacchus March community. The event was funded through the Greening the West – 1 Million Tree program which is supported by the Australian Government’s 20 Million Trees Programme (part of the National Landcare Programme).